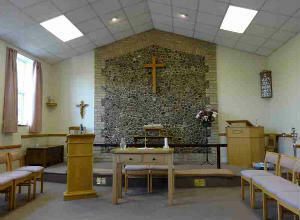 This church’s outstanding feature is its warm, friendly atmosphere. It is an open, welcoming Church offering modern interactive worship for all ages. There is a mixed age range and frequent all-age-worship services, always with enthusiastic hymn-singing. 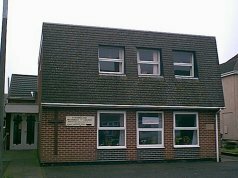 There are now only a few children who attend regularly, but all who come are made very welcome. The church actively supports a mission-school and orphanage in Borneo, also a schoolgirl in Uganda. Money is raised regularly for Christian Aid, Action for Children and a local charity E A C H, amongst other causes. Special services at Christmas, Easter, Women’s World Day of Prayer and Pentecost, some of which are inter-denominational, shared with the local Anglican Church and the Fishermen’s Bethel. Tuesday 10am – 12 noon Coffee Morning – very popular locally. Thursday 7.30 pm Prayer Group - relaxed and informal. Other regular activities include various fund-raising sales such as a Christmas Bazaar and specific sales of plants, books and toys. There are occasional Beetle Drives, Theme Evenings and Sponsored Events (walks and cycle rides). For several years now, there has been a hugely successful pantomime, largely driven by church members, performed in the local Community Centre in January. Finally, several members of our church are bravely tackling the ‘Read the Bible in a Year’ challenge.